A roadside snail sales sign. 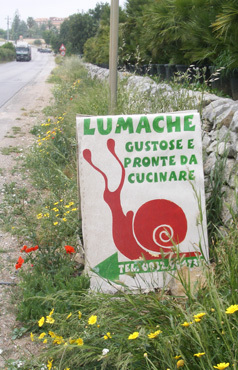 "A passo di lumaca" was the Italian phrase that popped up on the screen of my little electronic dictionary when searching for the Italian word for "snail". Several years ago we'd taken refuge from the hot sun in a grassy roadside area to eat our lunch--an area that was crawling with snails. Learning the names of common things is pivotal to our self-directed language studies, so learning the word for "snail" was an obligatory activity during that picnic in the Italian mountains. All the better was to find an idiomatic phrase for our new playful word--a phrase we quickly incorporated into conversations with startled Italians as it described our mode of travel. Bill always says "There are no wasted words" as no matter how obscure, any word we learn comes up again, which was the case with "lumaca." Italians don't just look at them like we do, but they like others, consider the little guy's a delicacy for the table. After a rainy day in southern Italy and in Sicily, it is common to see dozens or hundreds of people bent over in open fields with a sack or bucket in one hand. Using our trophy word, we confirmed with one of the workers that they were indeed gathering lumaca, which were plucked off of stalks of grass. We imagined that the captured lumaca were both going to the gatherer's table and being sold. Once one is sensitized to lumaca, you frequently see them in southern Italy. In coastal areas, we've seen the lamp cover part of several story-high street lights encrusted with the snails as well as a thin trail of them on the way to the top. They'll be coating a roadside bush or scattered on the road shoulder. In street markets, the lumaca may be sold in net bags or loose in a bin. 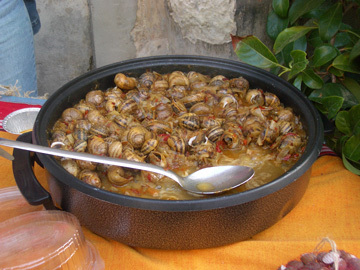 And occasionally a restaurant will entice potential diners with a curbside cooking of snails. Given my child-like aversion to certain "squishy" foods, letting the word roll off my tongue was enough proximity of the critters to my mouth. 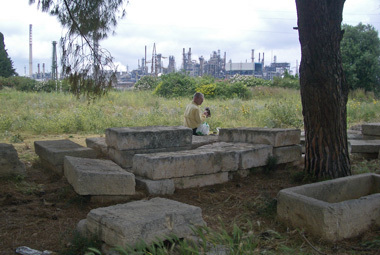 Lunch in an obscure Roman cemetery by an oil refinery. 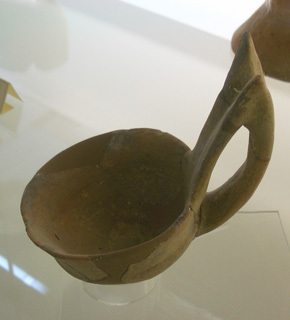 Lumaca sightings were an incidental part of our journey but it was the plentiful Phoenician, Greek, and Roman artifacts that were a big reason for us being in Sicily. That being the case, we took in many of the more obscure historical sites along the way to the well publicized destinations on the island. Unfortunately, there is usually a good reason that the obscure sites are obscure, and most delivered a low return for the effort. But especially with bike travel, having a string of mini-destinations fills out the experience so we took our time tracking down the dig sites often ignored by the tour buses. But there was nothing obscure about Siracusa (you're right, "Syracuse" to us), as it is one of the "must see" sites on a Sicilian itinerary. We stayed in a new B&B in an ancient stone building in the charming old town of Ortygia and enjoyed wandering the streets of what is technically an island at one end of Siracusa. But the much-touted Greek archeological sites of ancient Siracusa disappointed us. 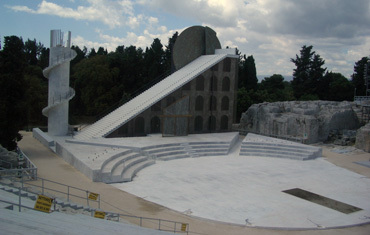 Siracusa's Greek theatre ruins with a modern overlay. Our Michelin Green Guide described Siracusa's theatre as "one of the most impressive theatres to survive from Antiquity." But when we were there, the rather spare-looking theatre ruins were mostly hidden by modern structures for the summer performance season--structures that would leave uninformed visitors with a very, very wrong impression of what Greek theatres once looked like. Given the distorted impression they were creating, we thought it quite the disservice that there were no drawings posted to correct the image. Much of the Roman amphitheatre was hidden in tall grass. Our grumbling about Siracusa continued as we discovered that half of the much-celebrated museum was closed for renovation. But by the end of our long, careful scrutiny of the exhibits, we realized that most of the material that was of interest to us was still on display. The museum delighted us with some astounding pre-Greco-Roman ceramics, but it was a "No Photos" affair. We'd love to share the images and extend our own memory of the thousands of year's old, 4-5' high ceramic pieces with photos, but we obliged the rules. Loved those fluffy papyrus plumes. We were also surprised that the only mention of Siracusa as Archimedes birth place was in our guide book. We would have thought that claim to fame would have been featured along with displays illustrating his more enduring discoveries. My biggest thrill in Siracusa however was free and easy, which was ogling a carefully cultivated patch of papyrus plants. Papyrus is more closely tied to the history of Egypt than Italy in my mind and yet the plant has all but been wiped out along the Nile. When we visited Egypt there were plenty of opportunities to buy freshly made papyrus scrolls from eager vendors but we didn't see the plants themselves, so it was a nice bit of closure for me to stare at the lush plants. 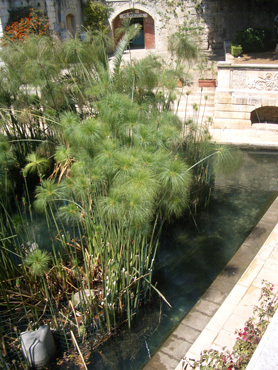 Enthralled, I followed up with a little online research about papyrus plants and briefly dreamed of owning a dwarf papyrus but then realized that the green, fluffy stage that kept me staring is but a short part of its life cycle. 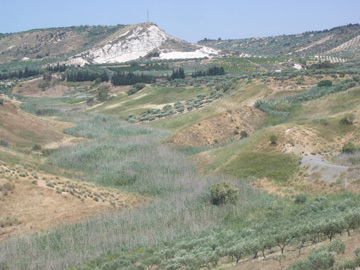 After completing our tour of the highlights of Siracusa, we drifted southwest into the hills of the hinterlands because of the lack of through roads along the coast. We'd again be seeking out the "B" and "C" list sights to entertain us as we made our way to the last big-draw on our grand tour of Sicily, the ancient sites at Agrigento. Though I have an active free-associating mind, when it comes to a volume of new material, I'm a linear-learner. I am careful to go through exhibit halls in museums in the prescribed order so as to keep my historical time-line sequential. That being the case, one of the the jarring aspects of being a 'road scholar' is having my time-line constantly jumbled. At the eastern end of Sicily as we headed south, we were heavily immersed in 2 historical themes: ancient Greco-Roman and baroque cities. With an almost 2,000 year spread, my mental time line felt like it was tied to a yo-yo. Looking at a map explains much of the reason for the Greco-Roman history of Sicily, which is the island's location. A near-bridge between North Africa and the European continent, parts of Sicily have been a prize for 7,000 years. But the Baroque theme in Sicily is one of those head-scratchers as you must be told the story to make sense of it. Sicily has and continues to be subject to fierce earthquakes (we felt none in Sicily but Bill was awakened in the French Pyrenees by a small quake) and the eastern end of Sicily had a doozy in 1693. That quake is considered one of the most devastating in modern history and 1500 subsequent quakes and aftershocks continued for the next 2 years. Sixty thousand people in the area died and 45 towns and villages were wiped out, some which never rebuilt. 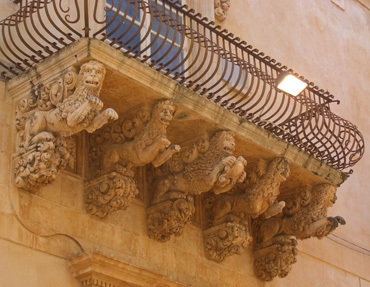 Baroque corbels in the city of Noto. Baroque was 'in' at the time, so some of the towns that did rebuild chose to go completely modern rather than replicate what was lost. A number of these cities chose not to further update over the centuries and instead retained their baroque facades. 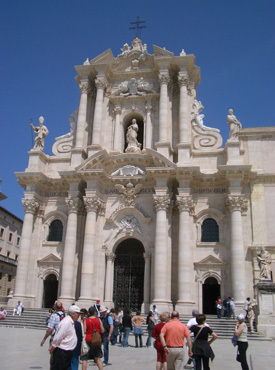 Catania was the largest of these baroque cities with its baroque-styled, lava-faced cathedral. Catania and 7 other southeastern Sicilian towns and cities have gained UNESCO World Heritage Site protection for their baroque heritage. So, for several weeks while at the eastern end of Sicily, our attention was alternately directed to Greco-Roman and baroque sites. Baroque is common in Europe and I'm not drawn to the style, so it's not surprising that other things were better at holding my attention. For me it was the look of southern Italy's Matera that we visited last fall that caught my eye. It was the centuries-old homes that evolved from caves or look like they could have that continued to intrigue me in southeastern Sicily. Agrigento and Siracusa are the 2 biggies, the 2 'gotta go' places if you are seeing the top sites in Sicily. The occasionally hot weather got stuck on the 'High' setting while we were in Agrigento, so part of our challenge was walking the miles of dusty grounds without collapsing from the heat. A bold cup from the pre-Greek culture. But despite our need for 'a passo di lumaca' in the heat, we were quickly reminded that Agrigento was yet another amazing Greek colony on Sicily. It was part of "Magna Grecia," like parts of the southern Italian mainland that we visited in the fall of 2007. The word "colony" always evokes a primitive image, perhaps because of more familiar stories of the pioneers settling far west of the US, but the ruins of ancient Agrigento made it quite clear that there was nothing primitive about these Greek colonies. Estimates vary as to the ancient city's population, which have been pegged by different historians at 200,000, 600,000, and 800,000. Founded by other Greek colonists in 581 bce, its founders came from Rhodes and Crete at the eastern end of the Mediterranean rather than the Greek mainland. 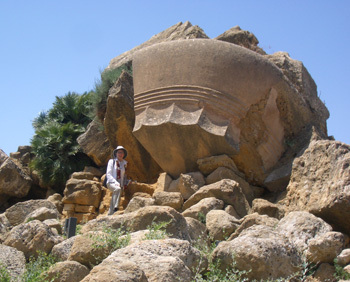 Coastal Agrigento was well sited for trade, which included commerce with Carthage in what is modern Tunisia. Agrigento was renowned in its day for its wealth which is echoed by the size of one of the larger private residences: it had 42 rooms and covered about 20,000 square feet. Imagine the size of the column that was under this capital. And it was at Agrigento that we learned that many of our culture's wedding ceremony traditions are rooted in Greek tradition. Elements such as the bride wearing a long white dress with a wide veil; the proper finger for a wedding ring; the groom carrying the bride over the threshold; and the tossing of grains all were a part of ancient Greek rituals. Being in Agrigento as everywhere in Sicily challenged our notion of the image of a stereotypic Sicilian. Before being in Sicily the word "Sicilian" triggered thoughts of a short, lean, dark haired, dark skinned Mediterranean person and yet we slowly became convinced that the Sicilians are among the least homogenous looking ethnic groups of any that we have seen. Being a crossroads is one reason for the diversity, but many places along the Med have been crossroads, like Turkey, and there are still clusters of common features in the people of those lands. We learned that it was the presence of the Normans around 1200, who were descendents of the Vikings, that added the heavy dose of fair skin, blond and red hair, and green eyes to the mix that we often saw in Sicily. Surprisingly, these traits have visibly persisted over the centuries. When first in Sicily, I was repeatedly stunned by hearing one of these very fair-haired adults blurt-out a string of well-spoken Italian when I expected to hear English or German. Nope, though fairer than me with my northern European and Scandinavian ancestry, they were clearly locals. Time and time again this happened and I finally learned to quit anticipating the language spoken by the speaker's coloration when in Sicily. A Boston man who works for a few weeks each year on the Sicilian farm of relatives described his Sicilian family as "technicolor" because of the wide color spectrum. If any physical characteristic typified the Sicilians we saw it wasn't their hue or features but their stature. Like other regions with a long history of poverty, many people were very short. Seeing middle-aged adults not yet compressed by osteoporosis that didn't clear 5' was a common sight. We'd look at their features carefully for abnormalities like dwarfism and they weren't obvious--it seemed more likely that we were seeing the results of poor childhood nutrition and that's all. Our first days of hard riding in Sicily had us indulging in the local sweets--you know--as part of our cultural experience. I swore-off most desserts in college but we were working so hard those first days of our 2008 touring season that we needed extra calories. Usually we go for more fruits and veggies but we made a rare detour to the pastry shop instead as baked goods were much more readily available at the moment. The good news for us was that we didn't want a second serving of any of them. The first indulgence was in Erice with the regional specialty of cassata--a ricotta filled dessert. It was terrible. It looked lovely but the single serving we bought direct from the bakery was horrifically sweet and tasteless. It had a beautiful thick layer to hold the ricotta together but it turned out to be a dough-like mixture of glucose syrup and sugar. If the ricotta filling had any flavor, it wasn't discernible through the glucose leather. Bill also picked out a green pistachio ball that must also have been glucose syrup and sugar. He could detect a hint of pistachio flavor through the sugar, but it escaped me. At breakfast two days later we were served some little Madeline-like filled pastries but they too were short on flavor. That was enough experimenting for awhile and we'd settle on our daily ration of chocolate that's budgeted into our lunch calories to satisfy our sweet-tooth with a more certain return. Yes! 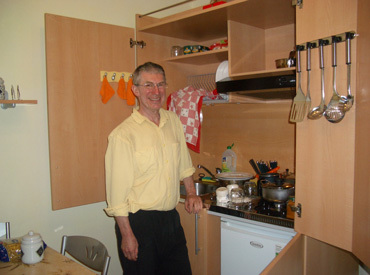 A closet-kitchen with espresso supplies. While in Sicily Bill indulged in Italian coffee on an almost daily basis, something he had dabbled with when traveling in Italy last fall and when at home over the winter. In southern Italy last fall he began experimenting with the single-cup espresso makers that we've dubbed as 'rockets' that were in our apartments or B&B's and he loved the flavor. A taste for coffee was cultivated in him as a child but he always liked it weak, until these Italian espressos turned his head. In Sicily our B&B's would sometimes have a kitchen or they would provide a ticket for a coffee and a roll at a local bar. The lure of espresso overwhelmed Bill's shyness and he ventured off alone to the bars for his morning java. And once he got the hang of the Italian bar ritual for morning coffee with the tickets, he would buy a cup when it wasn't included as a part of our lodging. Not a coffee drinker, I was happy to spend his coffee-time in our room working on the laptop which is always in high demand. And Bill is one of the lucky few who doesn't go through physical withdraws when his coffee habit is interrupted though he longed for the potent flavors when we left Sicily. Lost Its Luster Or #1? Somewhere after Messina, Sicily started losing its luster. Siracusa's and Agrigento's Greek archeological sites were heavily touted by our guide books but they didn't match our expectations. Siracusa had some wonderful Neolithic and Bronze Age ceramics which we weren't allowed to photo and they had no postcards of them, making the experience even more transient. 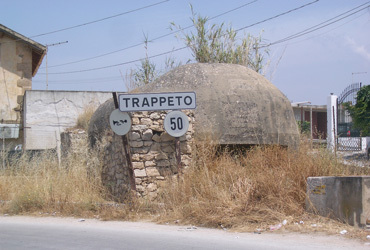 bunker at an intersection) to catch our attention. The baroque styled buildings in the UNESCO World Heritage cities were interesting to note but not grand. We continued our "Giro di Sicilia" or "Circle Around Sicily" along the eastern end and southern coast taking in most of what our guide books recommended but we were left shrugging our shoulders. Traffic got heavier and I started using an ear plug on the traffic side ear to decrease the stress level. Bill kept saying "Maybe it's time to leave Sicily." He had struggled for weeks trying to decide when to exit Sicily and to move north to Sardinia, though the ferry availability had left us fewer options than he expected. Now his decision to skip Sardinia and finish-up Sicily was looking flawed--perhaps we should have left while we were still in love with the island. Escorting a scorpion out of our room one night and our Agrigento's B&B's garden that was doing double duty as a mosquito breeding ground didn't help matters. Our thoughts turned to whether the southeastern reaches of Sicily really were less interesting or whether we'd over-rated Sicily early in our stay and realism was setting in. The coastline and beaches around Gela were prettier than what we'd seen on the northern coasts but the area didn't enchant us as we aren't beach people though we love rugged coastlines. The inland hills had a different look every few miles. The matter of "What is the problem?" was settled when we again turned inland to head over the mountains at Calatafimi towards Palermo: we were instantly in love with Sicily again. Those hills, those mountains, those panoramas were wonderful. We stopped over and over again to experience and re-experience our delight with the shapes of the slopes, the compressed valleys, the rugged surfaces, and the elaborate patchworks of cultivated land. A few days later when we were poised to descend out of the mountains onto the northern coast near Palermo, I boldly proposed to Bill that for me, Sicily had nudged the northern Italian Dolomites and Turkey off of their shared spot as my favorite cyclotouring destination. The Dolomites deliver more stunning scenery and Turkey still is #1 for ancient history sites and cultural experience, but Sicily is a better overall package. Sicily has a good, though not great, assortment of ancient sites to visit and good associated museums. The distances between the available sites is much shorter in Sicily than Turkey, making it much easier for those of us on bikes. Great historical or archeological sites don't exist in the Dolomites, though the Bolzano museum is excellent. Sicily's post-ancient stories were more interesting to see than the same-era stories in other regions, stories such as the Norman occupation which was represented by the churches of Monreale and Cefalu and the 5 villages reflecting the Albanian exodus from the Ottomans. The quality of the day after day scenery experience in Sicily's interior (not along the coasts) is as good as it gets for cyclotouring. The Dolomites vistas are more intense and prettier, but they occur in a very small area and Turkey's interesting scenery is much more intermittent. The quality and availability of the food in Italy makes for easier travel than in Turkey. The new B&B phenomena spurred by EU funding in Sicily makes lodging easier to find and more pleasant than Turkey and often cheaper than in northern Italy. And compared to Turkish, Italian is much easier for English-speakers to pick-up or muddle through. Our total of 12 weeks in Sicily is comparable to our time spent in both the Dolomites and Turkey, so we feel it's a fair comparison. Sicily is our new overall winner for the most well-rounded experience for cyclotouring. I'm not sure Sicily would make as strong of an impression for car travelers as the changing scenery on the back roads of Sicily's interior might go by too fast in a car to have as much impact. In contrast, the condensed experience that car travel provides probably enhances the impression of less changing countryside in more expansive countries like France, Spain, and Hungary. Though Bill had been wrestling with both the timing and location of our post-Sicily itinerary for more than a month, it was a shock when on a Thursday he announced that we'd be on the first of 2 boats the following Tuesday--boats that would each do their part to get us to Barcelona, Spain. Thinking of being in Spain, in Barcelona, was immobilizing. At that moment, we were still on the southern Sicilian coast with some misgivings about the scenery. But Sicily had become so familiar, so comfortable, that it was jarring to think about leaving. The sale of our house had nudged out much of our language study time and yet our Italian had still progressed. The thought of switching to very rusty and more rudimentary Spanish made us quiver. I thought too of the elements of southern Italy and Sicily that had made us nod in agreement with English-speaking Sicilians that said their people were old-fashioned, stuck in their ways, and backward. We understood what they were referring to at the time, but now it was less clear. The inconveniences, the shortcomings, had long since been adapted to or worked around and were no longer on my mind. I couldn't readily remember what they were. As Bill said "I'm starting to feel like an Italian" and part of that process was shrugging off the inconvenient differences and savoring what is and there was plenty in Sicily to savor, especially as cyclists. But the rising temperatures that had taunted us in Agrigento were set to top a 100°F and it was time for us to be in the mountains--not of Sicily but of the continent. A cooler than usual spring had allowed us to linger, but it was time to leave and we knew it. So, in a matter of days we were coping with the odd feelings of being boat people for about 48 hours as we catapulted ourselves north to more bike-friendly temperatures. Our memories of pleasant, long-distant journeys on handsome Greek ferries with many inviting nooks for sitting weren't matched by the 2 fresh, but more cargo-oriented ships. We'd make a few rounds in the small public spaces several times each day but found our small cabins the most comfortable places to be most of the time. Mediterranean ferry travel is always an interesting cross-cultural experience as, especially in the off season, the cargo trucks are the big customers. The patiently bored truckers are easy to spot on board and its entertaining to see how their affect differs from the tourists. 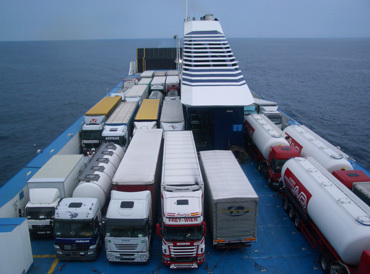 European truckers don't push the rough and tough image that American truckers cultivate, which makes mingling with them more pleasant. Cargo trucks, not tourists, were the primary customers. My resolve to keep my commitment to 2 hours of exercise per day while on our 2 different ferries went adrift in mild motion sickness in rough seas. Taking ginger root and literally laying low in bed when it was the roughest kept the symptoms in the "mild discomfort" range, but that strategy eliminated any rambunctious activity, like doing laps on the staircases. For exercise on board I settled for an hour of mostly in-bed sit-ups, stretching, and weight lifting with a 2 kg (4.4 lb) bottle of water. Despite the tendency towards feeling ill, we were able to keep busy with planned reading and computer activities but the productivity and pleasure of the 2 days was lower than anticipated. We'd been dreading making the switch to Spanish from Italian but the trilingual signs on the Genoa-Barcelona ferry made for an easy beginning. I was captivated by the "Please hold the handrail" and shower safety warnings, each which allowed a comparison of the constructions in Italian, Spanish, and English. Such signs are terrible places to learn basic grammar but are grand for picking up the everyday words. Unfortunately we'd soon be reminded that it wasn't standard Spanish that we'd need but Catalonian, which leans more towards French than Italian, at least for our comfort. We have just wrapping up our east to west tour of the French and Spanish Pyrenees and have an eye on the Italian Dolomites. We have reservations for 2 weeks in Selva in the eastern Italian Alps at the end of August so Bill has his work cut-out for him to get us there. We are usually in the Dolomites in June or July but given the rain they are still experiencing, we're all the more glad to be in the drier Pyrenees this year. We'll be combining a little train travel with biking so we can to get to Selva by the end of the month. Bill's first plan for train travel in France fell through as the lack of direct service would have required hours of travel in the opposite direction and multiple train chances for a small gain in miles. Hopefully we'll find more direct service for some segment of the journey in the coming weeks. In the meantime we'll enjoy the increasing foothill and then mountain scenery as we make our way into the Alps from the French side.